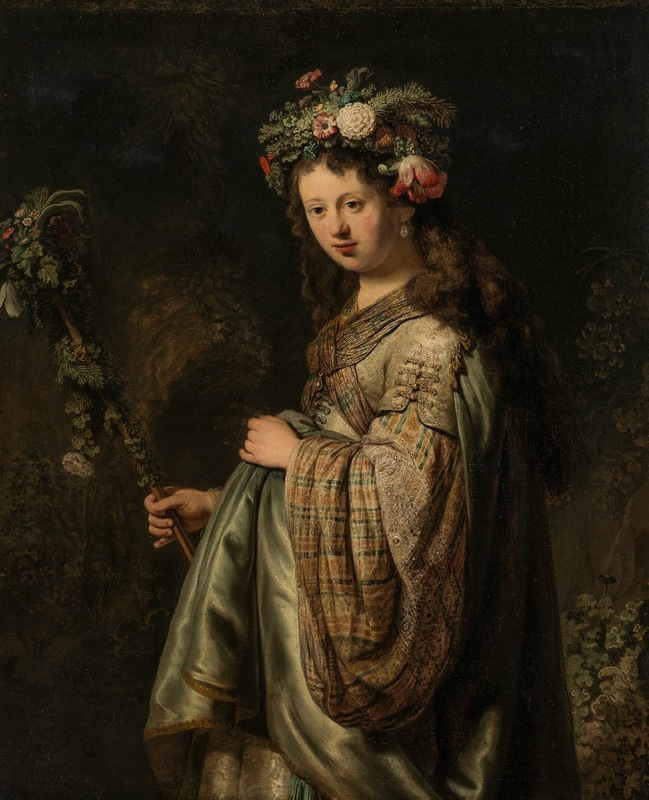 Flora or Saskia as Flora is a 1634 painting by Rembrandt, showing his wife Saskia van Uylenburgh as the goddess Flora. It is now in the Hermitage Museum in St Petersburg. "206. Flora. Bode 336 ; Dut. 267 ; Wb. 412 ; B.-HdG. 189. She stands, in profile to the left. She turns her face, which has Saskia's features, with a slight inclination towards the spectator. In her right hand she holds a staff entwined with flowers diagonally before her; she lifts up her long mantle in front with her left hand. Her hair, adorned with a large garland of flowers, falls in long curls down her back. In her ear is a pearl. She wears a dress of gay pattern with loose sleeves, a scarf crossed on her bosom, and a light blue mantle falling from her shoulders. The light, which is evenly distributed, falls from the left. Thick bushes form a dark background. Life size, three-quarter length. Wrongly called until now "The Jewish Bride". canvas, 50 inches by 40 inches. Etched by N. Mossoloff in Les Rembrandts de l'Ermitage ; and in the Zeitschrift für bildende Kunst, viii. Mentioned by Vosmaer, pp. 504, etc. ; by Bode, pp. 424, 60 1 ; by Dutuit, p. 37 ; by Michel, pp. 175, 567 [134, 441]. Saskia in veste di Flora è un dipinto a olio su tela (124,7x100,4 cm) realizzato nel 1634 dal pittore Rembrandt Harmenszoon Van Rijn. È conservato nel Museo dell'Ermitage di San Pietroburgo.